Ravenswood’s first and founding Headmaster. He was born on the 18th January 1893 in Ilkley, Yorkshire and was the son of a Master Printer. He attended Repton School, Derby and continued his further education at Emmanuel College, Cambridge; where he gained a BA. He was called up for service into the 7th Somerset Light Infantry (Prince Albert’s). As recorded in the King’s Birthday Honours List of 1916 he was awarded the Military Cross. He held various wartime officer ranks in the Great War but on discharge held the rank of Lieutenant. Fast forward to 1939 when he was again called for military service. His service number was 10761. He held various ranks up to Temporary Major and War Substantive rank as Captain and served in the Auxiliary Military Pioneer Corps. The Corps at its peak in May 1945 was probably the largest Corps in the Army. It included 12,000 Officers, 166,000 British Personnel and 400,000 Commonwealth Personnel. As well as being responsible for a civilian labour force of 1,074,000 and a Prisoner of war force of 173,000. What motivated Durbin S. Spark to set up a school I cannot discover. It is noted that he married Winifred Norrington (from Chard, Somerset) in mid 1921 and it was in September 1921 that, according to the earliest Chronicles, eight small boys sat down to their first lunch at a large wooden table in the dining room of the newly created Ravenswood School. Four boys sitting on either side:- E.P.C. Langdon, P. Griffin, G.M. Ward, R.K. Husband, F. Canning, G.A.H. Gould, B.H. Smith & E. J. Carver. 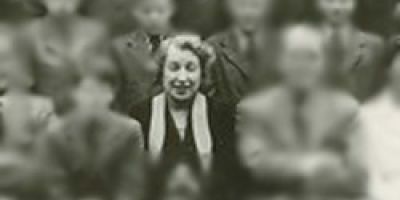 The 28th June 1922 marked the birth of the newlywed couple’s only child, Mary Joice Spark and by the summer of 1922 the number of pupils enrolled at the Paignton school had increased to fourteen! By the time the 1926 School photograph was taken numbers were up to thirty three, three of which are not included in the image as they are noted as being ill ! 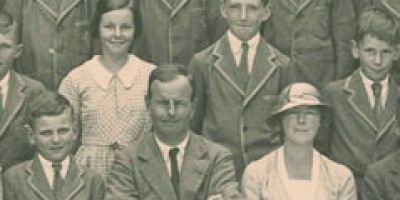 Incidentally Mary, Mr & Mrs Spark’s daughter, makes her first appearance in the 1924 photograph and appears in every school photograph we have copies of up to and including 1934. She then entered Sherborne Girls School, the first and possibly only Old Ravenswoodian to do so, certainly up until the 1970s. The image is of Mary Joice Spark in 1934 stood behind her parents – as the only girl in the image that description is somewhat unnecessary! “There (Paignton…rmh) we played matches against schools so much bigger than ourselves that we never had a chance winning; there we had our Annual Sports. It was at Paignton that the Wolf Cub Pack was started and some of the games which we played there are still played by the pack today. (Feb 1934 – rmh). 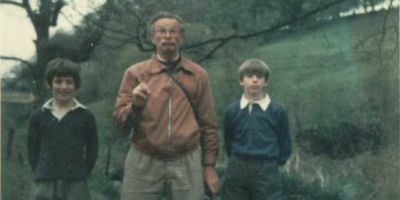 In 1925, when several of the boys were eleven years old, the Scout Troop was started and within a month nine out of the twelve boys had passed their Tenderfoot Test! It was also that we acted first acted “The Page in History.” It was so successful that we did it a gain in public and made £12-16s-0d for Dr. Barnardo’s Homes. But what is far more important, it was at Paignton that the foundations of the School were laid. We were very small and very young in those days but it was those boys who set the standards and started the traditions of the School. Others have carried on what we started but we all owe something to those “Paignton” boys for what they did. In 1928 the School consisted of 21 boarders and 11 day-boys and was absolutely full. We could not expand or become as big as other schools in the district. Our walks were gradually being restricted by new building, our time on the games’ ground was more and more limited and our little Playground was overcrowded. There were no “grounds” for Scouting and we had not even space for cricket nets. Then came the great change. It was decided to uproot the School and move to Stoodleigh. Not only all the boarders but eight of the day-boys came with us and in May 1928 we found ourselves at Stoodleigh with 30 boarders. Mr Spark was called up in 1939 and passed the headmastership to his deputy Mr Oliver Francis Huyshe who in turn was assisted by Mr & Mrs Phipps from Pembroke House School when they arrived in mid September 1939. It was not until June 1945 (according to one source) did Mr Sparks return to the School and pick up the Headmastership and Teaching again.. I refer to him mostly as Mr Sparks as he is confusingly referred to by teachers and pupils at various times as Captain, Major and Colonel. I have not attempted to delve into his military records but he certainly achieved the temporary rank of Major on the 15th February 1941. In actual fact he died on the 30th December 1964 at Portland Avenue, Exmouth, I have been unable to trace any form of Obituary but will keep searching. With regards to our first Old Boy / Girl - Mary Joice, it is most fortunate that she kept in touch, having gained entrance to Sherborne Girls School, with her parents and that her father, in turn, thought it appropriate to record some of her less personal communications in the Ravenswood Chronicle but as our Book of Chronicles (Volume one) takes us up only to November 1937 we have no further information until, courtesy P & O we have information relating to her sailing to Karachi on the ‘Chusan’ on the 7th November 1950. In 1955, 1957, and 1959 she is shown on the passenger lists bound for Karachi. In the India and Pakistan Ecclesiastical records 1949 – 1967 she is shown having married John Nigel Shapto Craster in Madras in 1950, John Craster was born in August 1922, where unknown, he died in Devizes Wiltshire in September 1997. A brief insight into his wartime military service is that he was promoted to temporary Captain on the 19th September 1946, service No. 271820. On the 1954 Passenger List Mary Joice Craster’s entourage consists of Andrew P. S. born 1st August 1952, and Barnaby born 11th September1954. The Passenger List for the 1959 voyage shows that the family has increased and we now have Alison J. born 21st September 1956 and Alexandra M. born 9th April 1958. Mary Joice Craster (nee Spark) died in 1st quarter of 1977 in the Windsor / Maidenhead Area – my attempt to contact Andrew P. S. Craster, believed to be living in the Beckenham area of Kent has so far drawn a blank. 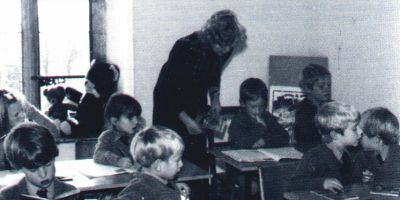 Whilst the School was in operation each successive Headmaster showed an interest in the achievements and progress through life of former pupils, often under the heading “Old Boys News.” Mary Joice certainly came into the category of ‘former pupil’ if not strictly an ‘Old Boy’ and it is through the formation of Ravenswood School by her parents that she received her education until she gained entrance into Sherborne Girls School. As much as I hate Copy Typing I feel it appropriate to record the News that she passed back to her parents from Sherborne and which her father, after parental censorship, included in the March, July and November Chronicles for 1935, 1936 and 1937 which we are fortunate to have in our Archives – it is a pity we cannot source any between the years 1937 and 1952; Are There Any Out There? Mary J Spark was very much a part of Ravenswood, noticeably she appeared in the School Photographs but the February 1934 Chronicle records that she excelled in Music to the degree that she won a Music Prize. All the entries in the Chronicle were placed there by either Mr or Mrs Spark and are extracted from Mary’s personal letters to her parents. Possibly the first recorded example of cross dressing in the School’s history. In July 1934 Mary passed the Sherborne Girls’ School entrance exam. March 1935 Chronicle Mary J. Spark has quite settled down at Sherborne. Apart from falling in a muddy stream and getting soaked, she had a good term. 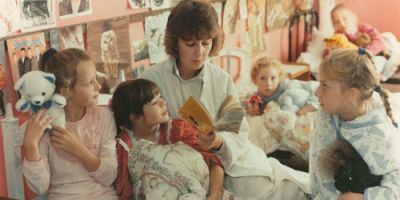 Even the catastrophe had its bright side, as it meant that she and the others had to go back to School and two of them found their parents waiting there wanting to take them out, They would not have been back for another hour if Mary had not been so obliging. July 1935 Chronicle Mary J. Spark 1922 – 1934 writes from Sherborne saying that she is enjoying everything at Sherborne and writes very happily. She says:- “I am head of my f=Form now – not through brains though! The Form votes for the Head and Vice Head. I don’t have to do much except lead up to prayers and fetch mistresses’ books before lessons.” We receive long and interesting letters but cannot quote from them! November 1935 Chronicle Mary J Spark went back to school two weeks late as she had to have her appendix removed in the holidays. She is now quite fit and though not allowed to play games is enjoying everything else. November 1937 Chronicle Mary J. Spark 1928 – 1934: “On Wednesday we had a cinematograph show. It was on swimming, floating and diving. There was a sound apparatus, too, so that we could listen to the instructions. It was marvellous, most of it being done in slow motion and quite frequently the diver was made to stop in mid-air to show his exact position. “On Friday I played Squash! I went with three others from different Houses to a small court near Castleton. It is quite easy to play well enough to enjoy the game. As none of the others had ever played before we all got on quite well together. It was a single court and one of the House-mistresses coached us. That, I’m afraid is the last entry in the Ravenswood Book of Chronicles, Volume 1 and so we, at present, know no more about Mary’s educational and vocational successes or otherwise. One other nugget of information did however come to light. In May 1936 Mr Spark put forward the idea that many parents might like to present something to the school when their boys leavebut usually were at a loss as to what to suggest. Mr Spark took up the suggestion of a solid oak chair for the Hall. A standard pattern chair back then could be obtained for (including the carving of the name) for 25/- and it was reported in July 1936 that the first 4 chairs had been donated; they being P.H. & M.A. Stern 1931-36, W.R.D. 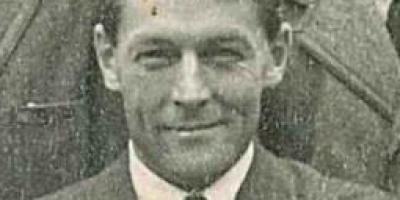 Gerald-Pearse 1931-36, P.V.H. Swan 1930-32 and last Mary Spark 1928-34. Please note that anything above in brackets (……rmh.) are personal comments by me. Although I have visited “Ravenswood” 26 Cliff Road, Paignton and have included here a few images it regretfully has very little architectural qualities relating back to the 1920s. The hall and lobby ceilings are original and so is the staircase to the upper floor which now houses the Paignton Sea Angler’s Association Club Rooms and Bar. All ceilings apart from those mentioned have been lowered and the cellars knocked from 3 into 1. The original windows have, on the main building, been replaced and only the ground floor has traces of the deep skirting boards typical of the time it was built. The entrance doors and conservatory style porch were removed in the 1980s There are no fireplaces or other architectural gems either inside or out. The gardens are well cared for as they are dedicated to and are maintained by The Burma Star Association. One can but guess as to the layout of the grounds back in the 1920s, the gardens were often the location for photographs taken across Torbay to Torquay and the postcards were usually Titled “View of Torbay from Ravenswood Gardens, Paignton.” The house and the 3 flats that are integral to the property do at least retain the name “Ravenswood.” Image, courtesy Britain From Above, taken in 1947. Ravenswood is in the centre near the cliff edge, the grounds being predominately to the left but also to the right. You are looking at the rear of the property, Cliff Road is the ‘U’ shaped road and the house’s frontage (unseen in the black & white image) looks on to it. ABOVE:- The postcard photograph of the NEW SCHOOL, which opened in May 1928. LEFT & BELOW:- Perhaps the very first advert to promote the School at its New Location, Stoodleigh. What the keen eyed person will have noted that this makes no reference to Oliver Huyshe as joint / deputy head and presumably his services had not been engaged at the time of printing, only Durbin S. Spark appears as the Head Master. Anyone with copies of the early Prospectus (prospecti ?) or any old memorabilia contact me, Richard Holladay 01626852512.